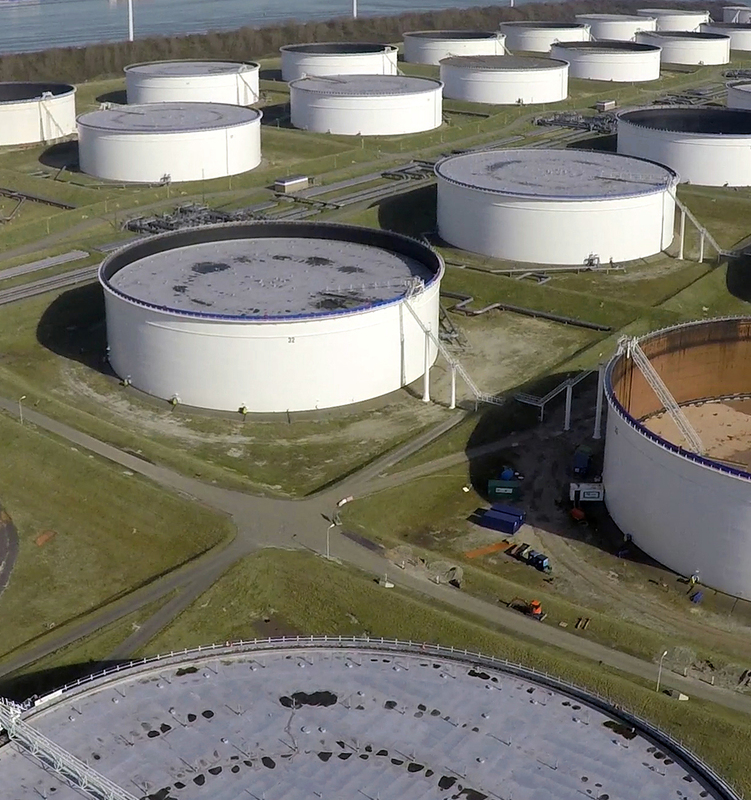 Mesa ETP is the exclusive carrier of WG Seals, an industry leader of primary and secondary floating roof seals for aboveground storage tanks. WG Seals engineers each product to meet unique circumstances, including floating roof and rim characteristics, tank profile, product stored, schedule and economic situation. WG Seals primary and secondary floating roof seals and foam dams have a proven record of success and are used by most major oil companies. Compression plate secondary seals, "in service" installation, multiple contact point secondary seals, double wiper tip seals, anti hang-up devices and rim mounted foam dams - now accepted standards in the industry - were all pioneered by WG Seals engineers and represent the Best Available Control Technology (BACT). WG Seals has over 4000 primary and secondary floating roof seals installed worldwide. A primary seal should be considered for all floating roof tanks, and listed below are a variety of choices. Mechanical shoe seals and resilient filled seals (i.e. liquid-filled tube seals and foam log seals) are the two main primary seal types. Tube and foam log seals risk "puncture", which would render them useless and represent environmental waste in disposal. They do, however, provide a "soft" connection against the tank which may be beneficial if the inside surface of the tank shell has a finished paint system. A mechanical shoe seal, which generally has a longer life span than either the tube seal or the foam log seal, represents the Best Available Control Technology available today. Two optional mechanical shoe seals are available; both offering "in-service" installation. The Channel Hanger seal is the more economic system, and is generally utilized in new tank construction and for retrofits where the annulus is in the "normal" range. Where significant out-of-roundness or unusual rim space measurements are found, a Compression Shoe seal is available. The Compression Shoe seal, which can provide a significant force along 90% of the circumference of the tank shell, helps minimize the potential for gaps between the shoe and the tank shell. Secondary Seals are normally required for external floating roof tanks, and may or may not be required when an external roof covers the floating roof. However, some localities require a secondary seal on a covered floating roof if the primary seal is a vapor mounted seal. Mechanical shoe seals, by their nature, are liquid mounted, and both tube and foam log seals can be liquid mounted. A compression plate secondary seal has a longer life than a "flapper". While the "flapper" offers a lower profile, it may not stand up against the environment of the stored product vapors, and therefore not be an appropriate choice. The Duo-Tip offers a lower profile than the 5" flat wiper when compression plate secondary seals are chosen. A variety of double seal combinations exist as a mix-n-match of all available primary and secondary seals shown, as well as Double Wiper Tip seals, which offer a unique selection. The American Petroleum Institute (API) does not define which floating roof seals should be utilized on any particular set of circumstances, but allows the end user to utilize the most appropriate set of floating roof seals. Refer to Standard API 650. The API has, however, done generic testing for emissions based on the following combinations of seals: Mechanical Shoe Seal, Resilient Filled Seal (both vapor mounted and liquid mounted), along with combinations of these seals with rim mounted secondary seals. The testing concluded that utilization of a liquid mounted primary seal (e.g. metallic shoe seal, or liquid mounted resilient filled seal) in combination with a rim mounted secondary seal provided a significant reduction in emissions when compared to primary seals alone. Refer to API Manual of Petroleum Measurement Standards Chapter 19.1 and 19.2 (formerly API standard API 2517 and API 2519).